When a tree fell down in an elderly Lake Oswego resident's backyard and damaged her fence, Nichols Family Agency owner Scott Nichols rushed to the client's home on a Saturday to make sure she was OK. Then, he returned the next week to coordinate a repair crew to fix the fence. To Nichols Family Agency sales producer Katie Stonesifer, the anecdote is representative of Nichols' selfless nature and part of the reason she nominated him for a prestigious community award. "He cares so much about people and his clients," she said. Following Stonesifer's nomination, The Rotary Club of Wilsonville selected Nichols as a finalist for the First Citizen award, given annually to an exemplary member of the Wilsonville community. Donna Atkinson, John Budiao and Curt Kipp are also finalists and the winner will be selected during Stars of Giving: The 2019 Heart of Gold Dinner and Auction Saturday, Feb. 23 at the Wilsonville Holiday Inn. For almost 11 years, while he worked for Enterprise Rent-a-Car, Nichols and his family bounced around from Washington D.C. to St. Louis and Florida. So when they moved back to the Portland area in 2010, the Nichols wanted to become rooted in a community. And, in Wilsonville, they have certainly lived up to that goal. Along with running Nichols Family Agency in Wilsonville, Nichols has coached many Wilsonville youth sports teams, is the president of the Wilsonville Basketball Association, has volunteered at football games and contributes to local causes through his business. "He's involved in everything, set up business in Wilsonville to combine personal life and work life and he constantly find ways to give back to the Wilsonville community," Stonesifer said. "It's (the nomination) a perfect opportunity to let him know that we appreciate him." In his first year in Wilsonville, Nichols was the assistant coach of his son Hayden's football team. Then, in the following five years, he served as the head coach of the team. Nichols mostly rode the bench for his high school football team but believes strongly in the power of sports to instill life lessons. "I think there's just a lot of lessons to be learned from it," Nichols said. "Learning to work together as a team to accomplish goals and persevering through difficult times and understanding how to be a good teammate even if you aren't playing as much as you want to and being humble in victory and defeat." After serving as the select team director, Nichols has been the president of the Wilsonville Basketball Association (youth basketball) for the last six years. In that role, he communicates with parents, works with league officials, organizes games and helps select coaches, among other tasks. "The board as a whole just does the nuts and bolts to make sure there is a program in the community from third grade to eighth grade," Nichols said. Nichols has also enjoyed running the clock at Wilsonville High junior varsity and varsity football games the last couple years. "Even when his oldest son (Hayden) was injured this past football season, he continued to go to every game and (do the) scoreboard for the team," Stonesifer said. Not to mention, Nichols' wife Colleen is a prolific volunteer at Boones Ferry Primary School, his daughter Taylor attends Boones Ferry, his son Jake is an eighth-grader at Inza R. Wood Middle School and Hayden is a sophomore at Wilsonville High School. "To me this is a nomination that is about my team also: my wife and my family. All of their support is important," he said. children. Nichols also recently became a board member for Rose Haven. 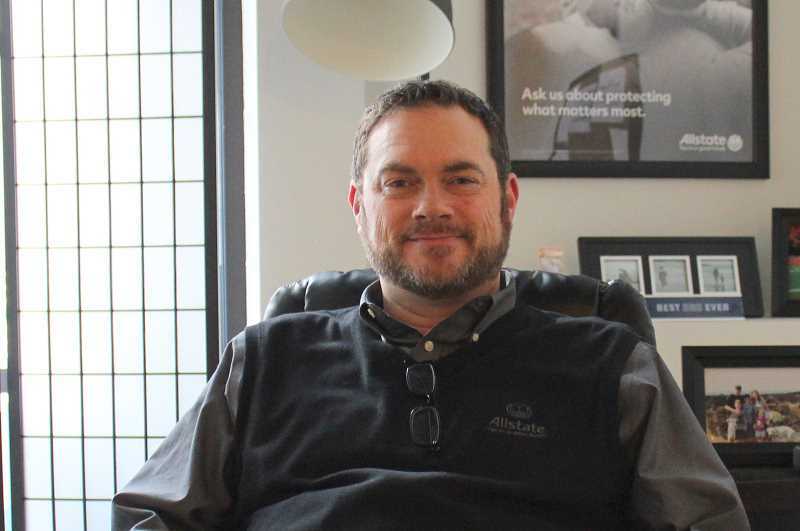 "I wanted to be very mission driven when I started the agency. As we started thinking about ways that we can use the agency to try to help others, having a separate campaign that has Lead with Kindness in mind and giving back felt like the right thing," Nichols said. Nichols found out about the honor when his friend and Rotary Club President Laura LaJoie Bishop visited his office. Initially, he thought Bishop came to discuss the Wilsonville High wrestling and girls basketball team crab feed. Upon Bishop's revelation, Nichols was surprised and heartened by the honor. "I'm an emotional person and not ashamed of that. It was emotional for me," Nichols said. "I was touched and honored. It's a great group of folks who were nominated. I don't expect to win. I don't care if I win. Just being nominated feels good." Correction: Katie Stonesifer's name was misspelled in a previous version of this story.